When asked whether he supports a no-first-use policy, candidate Trump stated that he would not be the first to use nuclear weapons, but then indicated that he would never take anything off the table. He seemed to question the foundation of U.S. alliances, when he indicated that he might not come to the aid of allies unless they agreed to pay the United States more for their defense, and to argue that some should acquire their own nuclear weapons rather than continue to rely on the United States for extended deterrence. He questioned the age and reliability of U.S. nuclear weapons, but seemed unaware of existing plans to modernize these systems. The new administration’s transition website states that Trump “will ensure our strategic nuclear triad is modernized to ensure it continues to be an effective deterrent,”2 but this lacks details about the scope of the expected programs or the policies that will guide the use of U.S. nuclear weapons. Even his year-end tweet calling for the United States to “strengthen and expand” its nuclear forces lacked the clarity needed to understand whether he was supporting the ongoing modernization programs or suggesting a broader expansion of U.S. nuclear capability. Each of the three presidents who have taken office since the end of the Cold War has sought to move the U.S. nuclear posture away from the Cold War legacy while addressing emerging nuclear challenges. During the Clinton administration, Pentagon officials initiated a Nuclear Posture Review (NPR) on their own; the Bush and Obama administrations did so in response to congressional direction. Although the three reviews each introduced new concepts and highlighted different goals, they pursued many similar objectives. Each review adjusted U.S. policy to recognize an improving relationship between the United States and Russia; each also called for reductions in the number of deployed nuclear weapons. They each argued that nuclear weapons continued to serve as a key element in U.S. national security strategy, but recognized that nuclear weapons would play a reduced role in that strategy. Each review also reaffirmed the U.S. commitment to extend deterrence to U.S. allies in Europe and Asia, and to varying degrees, each supported efforts to maintain and modernize U.S. nuclear weapons and the U.S. nuclear infrastructure. Congress has not mandated that the new Trump administration conduct a formal nuclear posture review, but the Pentagon likely will review U.S. nuclear weapons policies and programs in the coming months. This review would be useful for any new administration, given the changes in the international security environment since the Obama administration published its NPR Report in 2010, but may be particularly useful for an administration that seems interested in altering long-standing assumptions and approaches in a number of policy areas. As a result, the new administration is likely to examine the role of nuclear weapons in U.S. national security policy, the U.S. commitments to defend allies with nuclear and conventional weapons, and ongoing efforts to recapitalize U.S. delivery systems, refurbish U.S nuclear warheads, and rebuild the nuclear weapons complex. The Obama administration also narrowed the role of nuclear weapons by adjusting U.S. declaratory policy. Although the administration was not ready to assert that the “sole purpose” of nuclear weapons was to deter nuclear attack, it did declare in the 2010 NPR that the United States would “not use or threaten to use nuclear weapons against non-nuclear weapons states that are party to the nuclear Nonproliferation Treaty (NPT) and in compliance with their nuclear nonproliferation obligations.” U.S. conventional capabilities and ballistic missile defenses would be sufficient to deter and defend against chemical, conventional, and possibly biological threats from non-nuclear-weapon states.5 Press reports indicate that the Obama administration considered moving closer to the sole purpose declaration by adopting a no-first-use policy during its last few months in office, but rejected this change due to concerns about emerging regional security challenges and the effect the change might have on the credibility of U.S. assurances to its allies. The Trump administration may wish to reconsider the adoption of a no-first-use or sole purpose policy. Those who support this change assert that U.S. conventional forces are more than sufficient to assure U.S. success in a non-nuclear conflict and that first use of nuclear weapons against a nuclear-armed adversary risks uncontrolled escalation. Others, however, believe that the threat to use nuclear weapons may be needed to deter conventional conflict because an adversary might be more willing to launch a major conventional war if it believed it was free from the risk of nuclear retaliation. Thus, by leaving open the possibility of an extended conventional conflict, a no-first-use policy could undermine some allies’ confidence in U.S. commitment to come to their defense. More broadly, the administration may consider whether the United States should enunciate a broader role for nuclear weapons in response to emerging trends in the international security environment. For example, North Korea has continued to advance its nuclear and missile programs. China’s growing military capabilities, its lack of transparency about its intentions, and its assertive claims to disputed maritime territories have also raised concerns about regional stability. Finally, Russia’s nuclear modernization programs, along with its aggression in Crimea and Ukraine and possible changes in its nuclear doctrine, have raised concerns for regional and global security. Although many analysts consider the current U.S. nuclear posture sufficient to deter and respond to these challenges, others have argued that the United States should not only reconsider its declaratory policy, but also re-create the capabilities needed to employ nuclear weapons in a broader array of contingencies. A study completed in May 2015 argued that the United States should make it clear that “deterring nuclear attacks is not the sole purpose of U.S. nuclear weapons” because maintaining ambiguity about the circumstances under which the United States would use nuclear weapons has a broader, intrinsic effect in deterring threats to the United States.8 This study and others have also recommended that the United States introduce new nuclear capabilities into its force structure and prepare for the limited use of these capabilities in regional conflicts. Much of the debate about the role of nuclear weapons in U.S. national security strategy is wound into discussions about U.S. efforts to assure allies of its commitment to their defense. The goal of extending deterrence to U.S. allies has grown more prominent in the decades since the end of the Cold War. The Bush administration’s NPR Report listed “assurance of allies” as one of the key goals of U.S. nuclear posture; the Obama administration spoke of the need to provide reassurance to allies. Both administrations recognized that this reassurance derived from more than just nuclear capabilities, but both noted that the U.S. nuclear umbrella played a key role in convincing allies that the United States would come to their defense. The United States has taken a number of recent steps to bolster its commitments to its allies in Europe and Asia. It has expanded its missile defense cooperation with allies in Asia and has deployed missile defense capabilities in Europe to support NATO. It has also worked with NATO through the European Reassurance Initiative to strengthen conventional capabilities in response to concerns about Russian activities in Crimea and Ukraine. Yet, the effort to reassure allies has also included a nuclear component. The United States has flown nuclear-capable B-2 and B-52 bombers, as well as a conventional B-1 bomber, out of Guam in the Pacific, and B-2 and B-52 bombers have participated in exercises in Europe and over the Korean peninsula. In addition, U.S. ballistic missile submarines have made port calls to Guam and the United Kingdom. At the Warsaw summit in July 2016, NATO members reaffirmed that the group remains a nuclear alliance and that its deterrence posture relies in part on U.S. nuclear weapons “forward-deployed in Europe.”10 Debates, common in the 2010-2012 time frame, over whether the United States should withdraw its nuclear weapons from Europe have waned while NATO has refocused its attention on nuclear planning and exercises. During the presidential campaign, Trump questioned the value of U.S. alliance relationships in general and the relevance of NATO in particular. He argued that the United States was overextended around the world and that U.S. allies should contribute more toward their own defense or at least pay more for U.S. security guarantees. Further, he argued that the United States should pursue a more congenial relationship with Russia and noted that if Russia were to invade NATO states in the Baltics, the U.S. commitment to come to their defense would depend on whether they had “fulfilled their obligations to us.” Moreover, he suggested that some U.S. allies would be better served if they acquired their own nuclear weapons rather than relying on U.S. nuclear weapons for their defense. It is difficult to know whether or how these ideas would translate into policy in a Trump administration. For example, if Trump pursued a new agreement to improve U.S.-Russian relations, Russia might insist that the United States address Russia’s concerns with NATO enlargement, U.S. nuclear weapons in Europe, and U.S. missile defense capabilities deployed in Romania and Poland. 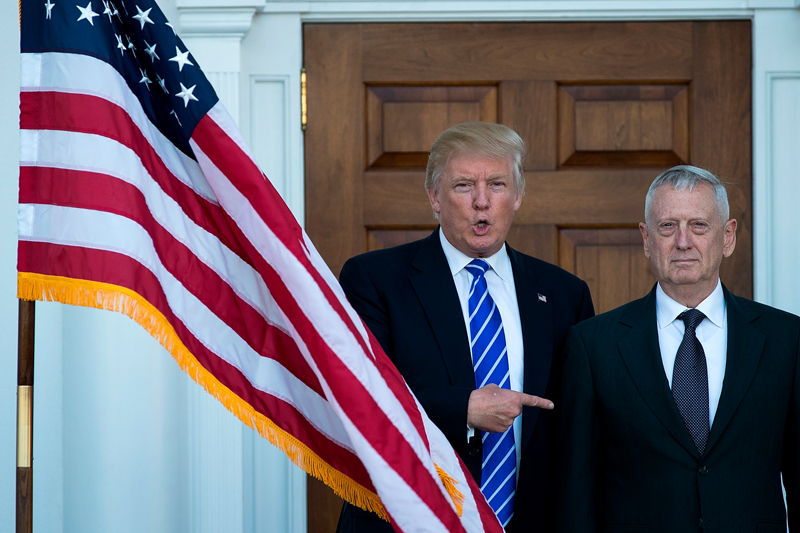 If a Trump administration did not value the U.S. commitment to NATO or did not think that nuclear weapons or missile defenses were critical to sustaining the alliance, he might agree to change these deployments. On the other hand, if the administration decides to retain U.S. support for allies in Europe and Asia and to view Russian and Chinese actions as a challenge to U.S. allies, the new president might support efforts to bolster conventional and nuclear capabilities in both regions. The United States is currently recapitalizing each leg of its nuclear triad (land-based ballistic missiles, sea-based ballistic missiles, and heavy bombers) and refurbishing many of the warheads carried by those systems. Land-based missiles. The United States currently deploys approximately 450 Minuteman III intercontinental ballistic missiles (ICBMs) and will reduce that number to 400 missiles under the 2010 New Strategic Arms Reduction Treaty (New START). The new Ground-Based Strategic Deterrent missile is intended to replace Minuteman III missiles beginning in the late 2020s. The Air Force plans to acquire 642 missiles to support testing and the deployment of a force of 400 missiles. Submarine-launched missiles. The United States currently deploys 14 Ohio-class ballistic missile submarines. 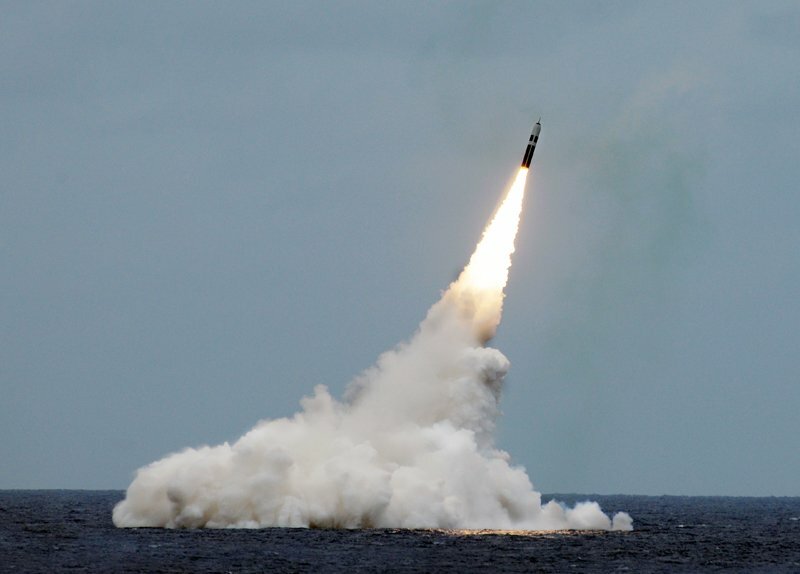 Each is equipped to carry 24 Trident II (D-5) missiles, but will carry only 20 under New START. The Navy plans to begin deployment of the new Columbia-class submarine in 2031. The Navy is extending the life of the D-5 missiles, and the National Nuclear Security Administration (NNSA), a semi-autonomous agency in the Department of Energy, is extending the life of the W76 warheads and beginning an alteration program on the W88 warheads, both of which are carried by D-5 missiles. Heavy bombers. The Air Force has 20 B-2 bombers, which can carry B61 and B83 nuclear bombs. The Air Force also maintains 76 B-52H bombers, which are equipped to carry nuclear or conventional air-launched cruise missiles (ALCMs). The Air Force is beginning the design and acquisition of a new heavy bomber, the B-21, that is expected to enter the fleet beginning in the mid-2020s. Bomber weapons. The B61 bomb is undergoing a life extension program (LEP) that will enhance the bomb’s safety and security and use control features. Also, the Air Force is designing a new tail kit for the B61 to improve its accuracy. The first new model is scheduled to enter the force in 2020. The B83 bomb is likely to be retired around 2025, after the completion of the B61 LEP. The Air Force is hoping to replace the ALCMs carried by B-52 bombers with a new advanced long-range standoff cruise missile, with deployment beginning by 2030. The NNSA is conducting an LEP on the W80 warhead to provide a warhead for the new long-range standoff missile. Analysts outside government have questioned the administration’s plans, arguing that the United States can sustain deterrence with fewer warheads or fewer types of delivery vehicles. Moreover, they note that these modernization programs could detract from U.S. efforts to procure advanced conventional weapons. Cost estimates for the nuclear programs vary, but most indicate that the Pentagon would likely allocate $30-35 billion per year to these programs during the 2020s and into the 2030s, as many of the nuclear modernization programs advance to the procurement phase. Thus, the costs, according to Defense Department and some outside estimates, would rise from a current 3 to 4 percent of the Pentagon budget to 6 to 7 percent of the budget, which could force trade-offs with other programs reaching the procurement phase at the same time. Congress is likely to support some increases in defense spending, but it may not be willing to increase defense spending by the amounts needed to fund all the new priorities. Recent years have seen increased pressure in Congress to reduce budget deficits through cuts in governmental spending while reducing tax rates. Although many members may now support some increases in defense spending, this may not be sustainable as long as Congress continues to support lower tax rates. As the Congressional Budget Office has noted, in the long term, an aging population, rising health care costs, and the rising interest on the national debt will reduce the amount of funding available for discretionary spending, including defense spending, if tax revenues do not increase significantly.16 Consequently, pressure on the defense budget and the implicit trade-offs within that budget are likely to persist into the 2020s and 2030s. The new Trump administration may support ongoing nuclear modernization programs because Trump supported them during the campaign and the Pentagon’s current plans fully fund the programs over the next five to six years. Yet, the new administration may still face questions about the future of these programs, and about the size and structure of the U.S. nuclear arsenal more generally, if financial limits continue to force trade-offs in future defense budgets. Moreover, as these programs move through the design phase and into production, technical issues, management issues, and cost overruns common in large military procurement programs could lead to further delays and budget pressures. Former Secretary of Defense William Perry is among the outside experts who have argued that the United States can eliminate the ICBM leg of the triad to reduce costs and mitigate the risks of an accidental nuclear war without undermining deterrence because submarines and bombers should be sufficient.18 Although it seems unlikely that a new review would recommend a change in the triad, the question should not be out of bounds. Even if the Pentagon and therefore the Trump administration continue to support the triad, it may reconsider the scope and scale of the modernization programs. Analysts outside government have proposed a number of changes, including delays or reductions in the submarine program, delays in the bomber program, and elimination of the long-range standoff or Ground-Based Strategic Deterrent missile program, to reduce costs and ease financial pressures coming during the 2020s. Because the Trump administration is likely to propose significant increases in defense spending, however, it is not clear that the financial pressures will materialize or that nuclear weapons will be seen as a burden on the budget. The outcome could depend on whether Trump attaches the same level of priority to nuclear weapons modernization. The Obama administration’s focus on the nuclear triad and consistent support for the modernization programs helped move the programs forward and preserved their funding during internal debates. The Bush administration, in contrast, did not share this enthusiasm for the nuclear enterprise or support requests for robust funding. It is unclear which approach will predominate in the Trump administration. 1. For a summary of some of Donald Trump’s campaign statements on foreign policy issues, see David A. Graham, “Donald Trump’s Radical Foreign Policy,” The Atlantic, July 29, 2016. 2. “Defense & National Security,” Greatagain.gov, November 21, 2016, https://greatagain.gov/defense-national-security-eb023007a60e#.xizv4i91d. 3. Rebecca K.C. Hersman, Clark Murdock, and Shanelle Van, “The Evolving U.S. Nuclear Narrative: Communicating the Rationale for the Role and Value of U.S. Nuclear Weapons, 1989 to Today,” Center for Strategic and International Studies (CSIS), October 2016, p. 7, https://csis-prod.s3.amazonaws.com/s3fs-public/publication/161018_Hersman_EvolvingNuclearNarrative_Web.pdf. 4. U.S. Department of Defense, “Nuclear Posture Review Report,” April 2010, p. 28, http://www.defense.gov/npr/docs/2010%20Nuclear%20Posture%20Review%20Report.pdf. 6. Aaron Blake, “The First Trump-Clinton Presidential Debate Transcript, Annotated,” The Washington Post, September 26, 2016, https://www.washingtonpost.com/news/the-fix/wp/2016/09/26/the-first-trump-clinton-presidential-debate-transcript-annotated/?utm_term=.fa852195da07. 7. General James Mattis, Statement before the Senate Committee on Armed Services hearing on the U.S. National Security Strategy, January 27, 2015 (hereinafter Mattis statement). 8. Clark Murdock et al., “Project Atom: A Competitive Strategies Approach to Defining U.S. Nuclear Strategy and Posture for 2025-2050,” CSIS, May 2015, https://csis-prod.s3.amazonaws.com/s3fs-public/legacy_files/files/publication/150716_Murdock_ProjectAtom_Web_Rev2.pdf. 9. Max Fisher, “Trump, Promising Arms Race, Could Set World on Uncertain Path.” New York Times, December 23, 2016, http://www.nytimes.com/2016/12/23/world/trump-nuclear-arms-race-russia-china.html. 10. “Warsaw Summit Communiqué,” NATO press release no. (2016) 100, July 9, 2016, para. 53, http://www.nato.int/cps/en/natohq/official_texts_133169.htm. 11. Matthew Kroenig, “The Renewed Russian Nuclear Threat and NATO Nuclear Deterrence Posture,” Atlantic Council Issue Brief, February 2016, p. 7, http://www.atlanticcouncil.org/images/publications/Russian_Nuclear_Threat_0203_web.pdf. See Anthony Juarez, “Remixing the ‘Appropriate Mix’: Reassessing NATO’s Deterrence and Defense Posture in the Face of New Threats,” The Center for Global Security Research, no. LLNL-TR-699505 (July 2016), https://cgsr.llnl.gov/content/assets/docs/Reassessing_the_mix_Juarez.pdf. 12. Steven Pifer, “Russia’s Rising Military: Should the U.S. Send More Nuclear Weapons to Europe?” The National Interest, July 21, 2015. 14. U.S. Department of Defense Press Operations, “Remarks by Secretary Carter to Troops at Minot Air Force Base, North Dakota,” September 26, 2016, http://www.defense.gov/News/Transcripts/Transcript-View/Article/956079/remarks-by-secretary-carter-to-troops-at-minot-air-force-base-north-dakota. 15. Mackenzie Eaglen and Rick Berger, “How Much Will Donald Trump Really Spend on Defense?” War on the Rocks, November 10, 2016, http://warontherocks.com/2016/11/how-much-will-donald-trump-really-spend-on-defense/. 16. U.S. Congressional Budget Office, “The 2016 Long-Term Budget Outlook,” July 2016, https://www.cbo.gov/sites/default/files/114th-congress-2015-2016/reports/51580-ltbo-one-col-2.pdf. 18. William J. Perry, “Why It’s Safe to Scrap America’s ICBMs,” The New York Times, September 30, 2016. Amy F. Woolf is a specialist in nuclear policy at the Congressional Research Service in Washington. The views expressed here are the author’s and do not necessarily represent those of the Congressional Research Service or the Library of Congress.